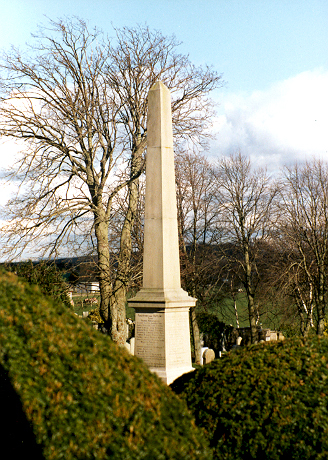 This monument was erected in memory of all of the Lanark-associated Covenanters. It lists those who were martyred, those who were tortured and banished, and also those who were fined. The immediate surroundings of the memorial were updated in 2017. Following the Pentland Rising at St John's Town of Dalry in Galloway on 13 November 1666, the Covenanters decided to march to Edinburgh. They arrived in Lanark on Sunday 25 November, around one thousand in number. On Monday 26 November the Covenanters filled the town centre. The Solemn League and Covenant was renewed. This was the first time this had occurred since it was drawn up in the 1640s. Rev John Guthrie, who had been evicted from Tarbolton Church in Ayrshire, stood on the Tolbooth steps and addressed the infantry. At the Townhead Rev Gabriel Semple preached to the horsemen. Those assembled raised their hands and swore their allegiance. The Covenanters then marched towards Edinburgh, where they were defeated in battle at Rullion Green, on 29 November 1666. On 12 January 1682 the Covenanters marched into Lanark where they published the Lanark Declaration. The leader was Rev James Renwick, and he and sixty men read the declaration from the Cross, which they had defaced with hammers. The Declaration was entitled 'The Act and Apologetic Declaration of the true Presbyterians of the Church of Scotland'. In it they adhered to the declarations of Rutherglen and Sanquhar and 'repudiated the unconstitutional acts of Charles II. The magistrates of the council were fined 6,000 merks for their slackness in apprehending the 'desperate villains'.